You can never have too many tanks, especially if they are coming from Horizon Tech. This brand has released several products that always give you an amazing vaping experience. We are being introduced to the Falcon Sub Ohm Tank from Horizon Tech, but this is not just any tank because this is the Resin Edition. So not only is it going to perform amazingly, but you are going to look good whipping this puppy out during any occasion. This Tank has a capacity to hold up to 5ml of e liquid, which is quite honestly more than enough to get you through an entire vaping day. Need a little more? Well, this tank comes with a bubble glass expansion that allows it to hold up to 7ml of e liquid. Clearly, this tank does not know you, but it already wants to please you. The top-fill design is even going to help you accomplish filling this tank up whenever you are running low. This tank uses a couple coils, so you will have to see which one you think performs better for your needs, but they both can take on a maximum wattage output of 80W. It has a dual adjustable bottom airflow that is going to allow you to control how much air can join you during your vape trip. This is the cool looking tank you have been itching to get and now is your chance. 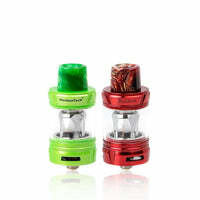 Falcon Resin Edition Sub Ohm Tank - Horizon has a rating of 4.4 stars based on 5 reviews.